Yesterday I wrote about the economic drag caused by squeezed state and local budgets, posting a figure that showed the loss to overall GDP caused by state/local contractions. Today, I’ve added state and local job losses to that picture. The figure below just plots the same data as in the last figure—the annual percentage point contribution or subtraction to real GDP growth from the state and local sectors. But it adds annual gains or losses in jobs. As you can see, it’s a very tight fit. Last year, state and local squeeze shaved about 0.3% off of GDP and cost 266,000 jobs. 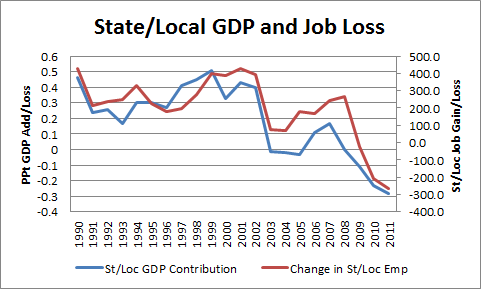 A simple regression of state/local job losses on the GDP contribution finds that for every point of growth that the states and locals take off of GDP, employment in the sectors falls around 700,000. We generally recognize that GDP losses map onto job losses but the fit is not usually this tight—there are lags in the generalized relationship between growth and jobs and lots of other moving parts. But that’s less the case in state and local governments. Here, the chain of events is pretty obvious and pretty clear. You squeeze their budgets, it shows up quickly and directly in growth and jobs. Conversely, and here’s the policy part, were we to use federal stimulus to help relieve their budgets, we could get this relationship running in a better direction. Though this is a federal case, Larry’s point reminds me of when the Federal Aviation Administration closed for two weeks due to Congressional gridlock on renewing their budget. About 4,000 federal workers were furloughed but about 70,000 private sector workers on FAA contracts were laid off. Share the post "What a Drag, Part 2"
9 comments in reply to "What a Drag, Part 2"
And this is only the quantitative picture. Several conversations with friends who work in public K-12 education (and Head Start-Early Childhood) last week had my hair on fire: kids who have no school nurses to coordinate a visit to the doctor or check eye health; no school counselors to deal with kids who come from homeless shelters, and more horrors. The quantitative info is very important, but I’d sure like to see it paired with links to qualitative ‘stories’. Because the tales that I’m hearing are hair-raising, and as someone with an interest in the neurology of learning when I extrapolate the implications out 10 and 20 years, it’s frightful. We’re eating our own seed corn and squeezing blood out of turnips. Yet the people that I know who are anguishing over cruel budget cuts have no money parked in the Caymans, and don’t stop to look at Congress and ask why we have such a screwy federal tax system that there’s no money for states and local schools. People are still not quite connecting those dots. The data shown here is really important, but I’d sure love to better understand what budget and government categories those cuts are impacting. This probably also does not count staff reductions at state funded places like universities. U of MN has not hired any new custodial staff for years. While on this subject I’ll mention my one main complaint with the SOTU address. The President had a line to the effect that if universities raise tuition their state funding should be cut. An an economist that understands feedback loops, don’t you think this makes no sense? U of MN has fought to keep tuition increases down as state aid has been cut and the number of students has increased, but there are no other sources of funds and employee intensive services typically rise faster than inflation anyways. So cutting funding in the face of tuition increases just guarantees more tuition increases. It seems to me tuition increases are the main feedback to the voters to indicate that schools should receive more funding. You just can’t say economics is going to work backwards and expect it to. This is the same problem with no child left behind, give the poorly ranked schools less money and expect them to improve. How is that supposed to work? Tom – the “cut state funding, raise tuition” feedback loop is exactly what is happening in higher education. Part of the increase has been met through expanded subsidies for student loans, but that (in my opinion) is the wrong way for government to provide education. Mike at Rortybomb has done some aggregation on the research in this area. It’s a national economy that’s failing, not the fault of the states. But they are nearing the brunt of it. It should be a point of a national union — with its unlimited ability to borrow — to help its parts without that ability get through the crisis with the least possible impact. Do you think Alexander Hamilton would have understood that? As I see it, money is the problem and will never be the solution. World hunger isn’t being solved by money, and probably never will be. Climate change won’t be solved by money, it will be solved by ingenuity. Addiction to money is a problem in and of itself. The world has enough to feed everyone, to educate everyone, to house everyone, to care for all those who are sick. Money has not motivated people towards altruism, it has discouraged altruism. Money has not improved our infrastructure, our infrastructure has crumbled because infrastructure, in and of itself, can not provide income, so money has discouraged the rebuilding of our highways, etc. At Davros, they talk of their fear of potential collapse, but if it weren’t for money, there would be no impeding doom. A world wherein money is the life blood of the entire system is inherently flawed. The problem isn’t just that there are a lot of greedy people out there, it is that a system based on money will always reach this point in any model one cares to run. It is the fundamental flaw. Our economy as a whole has always been the combination of the private and public sectors. Over the last two years, the private sector grew at an average annual rate of 3.2 percent, while the government shrank at an annual rate of 1.4 percent. The combined result has been economic growth of only 2.3 percent. Economic growth and employment growth would have been significantly stronger over the last two years without government cuts. Last year foreign buyers purchased more than $2 trillion in goods and services, the first time exports have topped that threshold. And most of those exports included petroleum, metals, chemicals and farm goods – – and accounted for almost 14 percent of gross domestic product, the largest share since at least 1929. These commodity prices raises the prices of life for most Americans. …reported “federal and private forecasters predict an oversupply will last for years” but that one company is “allowing gas leases to expire if it believes it can get a higher return by spending the money elsewhere” such as on oil which is near $100 a barrel. You see? It’s never about “energy independence”, it’s always about “energy profits”. That’s why I proposed an idea about the Keystone Pipeline, funding a massive non-profit public works program to build an oil company that’s operated and owned by our government (the people). That, or nationalize the entire energy industry and sell oil and gas to us, business, and our military AT COST. That would REALLY boost our economy!